Everlyn Sampi. Tianna Sansbury. Laura Monaghan. David Gulpilil. Ningali Lawford. Myarn Lawford. Kenneth Branagh. Drama. True Stories. 1930s. 01 Nigel's Choice. Education/Teaching. Prison. Police. Abduction. Road Movie. Desert. AFI Best Film Winners. Historical. Recommended. Australia's dark secret of institutionalist eugenics gets an impressive and heartfelt celluloid airing in this adaptation of Doris Pilkington Garimara's book, a story based around the astonishing real life journey of three young girls, removed from their true Aboriginal families and transplanted to a boarding school/prison to be trained as domestic servants (from whence it was hoped they would quietly blend into white society), and their 1,500 mile trek home with only a rabbit proof fence to guide them. 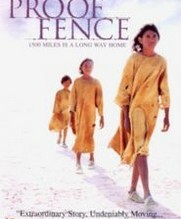 Rabbit Proof Fence portrays an all too recent slice of history with much passion.